Adventure Weekends In Nepalincludes most of the possible adventurous activities in Nepal, but it excludes long days trekking. 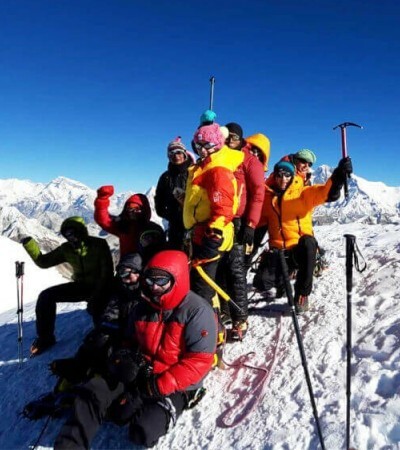 However, Rising Adventure organizes adventurous climbing and trekking too in accordance with the requirement of its clients including Adventurous Trips in Nepal package. During your adventure holiday trip, you will enroll in short days trekking, known as Dhampus Sarankot Trekking. The key feature of this trekking is that you will see the wonderful views of sunrise as well as sunset over the Himalayas like Annapurna, Machhapuchchhre, and Dhaulagiri and so on. Similarly, Kathmandu and Pokhara Sightseeing are also awesome that includes the UNESCO listed heritage sites of Nepal. Besides, White Water Rafting in Trishuli River is interesting where you can enjoy the white water and natural beauty of surroundings. In the same way, your trips becomes more adventure while you enroll in paragliding in Pokhara which is awe-inspiring. For doing it, you go to Sarangkot of Pokhara and involve in paragliding activity. If you are a perfect and an authentic licensed Paraglider and have the strong desire to glide it alone by yourself. You can do it alone. Otherwise, there will be the experienced Paraglider of Nepal with you and do the adventure paragliding activity. While enrolling in paragliding in Pokhara, you get the refreshment and enjoy it in front of the views of mountains over the stunning Fewa Lake. Whether you do it alone or with the Paraglider, paragliding in Nepal can be the immemorial experience of anyone. Furthermore, Elephant Ride in Chitwan can be another part of your adventure holiday. Actually, Elephant Ride in Nepal is also known as Jungle Safari. Only four people can seat on the back of Elephant except the rider. Then you have the safari of the Jungle for almost two hours. On the way to Jungle, you can see the various kinds of wild animals like deer, tiger, rhino, snakes, giraffe and many others. It is not too much daring activity. Moreover, Canoeing in Jalbire can also be the wonderful adventure weekends in Nepal. Although, Bungy Jump, Yoga Session and Zipling are optional for this trip, even these activities are more adventurous except Yoga. Rising Adventure is a young and the energetic adventure activities organizer in Nepal. If anyone is looking for adventure trips in Nepal, please, join our Adventure Weekends package. For more details, you can contact us at any time.